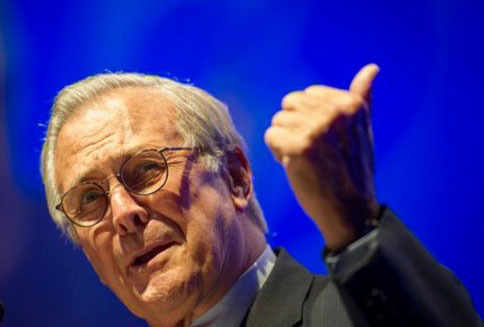 Former Secretary of Defense Donald Rumsfeld spoke at the 30th anniversary celebration of The Washington Times at the Marriott Wardman Park Hotel in Washington, D.C. on Oct. 2. Following is a transcript of his remarks. With the presidential election only a few weeks away, it’s appropriate to discuss where our country is today, and what it can be, in the years ahead. A few weeks ago, Mr. Biden, in his convention acceptance speech, exclaimed, “America is not in decline.” It strikes me when the Vice President feels he has to stand up and say that, it’s a bit like acknowledging that America is in decline, and that the world senses it, but he doesn’t want to admit it. Let me be clear − I do not believe America is destined to stay on its current trajectory toward becoming a second-rate nation. It can be reversed. Indeed, it must be reversed. No other nations, no foreign ideology, no militant movement can, alone, obstruct our path to achieve an even greater America. Only our own leaders can stand in the way of the American people’s rendezvous with their future and it is the American people who will make those decisions. Reversing this downward trend requires an honest accounting of where we are and how we got here. And I don’t think it will surprise anyone that I believe that reversing the trends of the last four years requires changing the leadership at the top. We have a President and an administration that routinely dismisses the work ethic that has made our country an exceptional nation and seeks to replace respect for personal responsibility with envy and division; where earned success is resented rather than respected. But probably of most concern, we have a President and an administration that fundamentally misunderstands the world situation today. Almost four years ago, President Obama traveled to Egypt. In a way only this President could phrase it, he said, “I’ve come here to Cairo to seek a new beginning between the United States and Muslims around the world, one based upon mutual interest and mutual respect.” He promised a radical departure from the policies of the previous eight years. He vowed to rein in our ally Israel and to make the Palestinian effort for statehood central to his administration’s foreign policy. The President went on to say that after the 9/11 terrorist attacks, “fear and anger led us to act contrary to our ideals.” He went to another country and contended that our fear and our anger led America to act against our ideals. In other words, after terrorists killed thousands of our citizens, we were the problem. Is there any other way anyone with an understanding of the English language could interpret his statement? This, in fact, has been a theme running through this presidency − to blame America and Americans. We saw it when he apologized for acts the United States had been involved in over the past 100 years. And we see it day after day as the President excuses failure after failure of his presidency by castigating his predecessor. Well, I served with President Obama’s predecessor. I watched him up close. Because of his leadership, our nation did not simply pound sand after the terrorist attack on our soil. He went after the enemy, destroyed their leadership, and put their operatives on the run. His administration rid two nations of two of the world’s most brutal dictatorships. And millions in the Middle East, for the first time in their lives, have at least a chance to be free. Most Americans do not apologize for our country. Certainly, the hardworking Americans who make up the backbone of our nation do not. On the contrary, they feel deep pride in who we are, what we have achieved, and what we stand for. Like them, President Bush did not apologize for the United States. He knows that America is not what’s wrong with the world. America, even with our imperfections, remains what is most right with the world. Instead of taking a firm stance against those who attack our embassies and our diplomats, this administration reserves its harshest words of condemnation for a provocateur video maker. One U.S. embassy issued an abject apology and a condemnation of those who “hurt the religious feelings of Muslims.” Instead of defending the Constitutional right of free speech, our senior officials dignified it as the pretext to rage and riot. Recall the various excuses that supposedly have led radical Islamists to kill in the name of God: Early on it was a book by Salman Rushdie. Then it was American troops in Saudi Arabia. Then it was Danish cartoons of Mohammed. Then it was Guantanamo Bay. Then U.S. support for Israel. Then it was supposedly global warming as Zawahiri and bin Laden once wrote. And now it is a web video practically no one has seen. This is not what motivates them to murder innocents. These are weak, convenient justifications that are all too willingly accepted. Yet our nation’s current leaders seem more interested in making excuses for our enemies than in defending the ideals on which America was founded. Ladies and gentlemen, the problem is not with America. It is with an intolerant, backwards ideology championed by radical Islamists. An ideology that is so intolerant it belongs in the Middle Ages, not in the Middle East; an ideology diametrically opposed to our ideas of freedom and equality. The radical Islamists have an ideology that insists that half the population not participate in commerce and public life; an ideology that sees Israel as the focus of evil in this world to be incinerated and its ashen remnants pushed into the sea; an ideology that shuns science and innovation for a return to the 7th century; an ideology that denies individual freedom and economic freedom alike; an ideology that revels in a cult of death and martyrdom; an ideology that denies the very existence of the nation state; an ideology that seeks retribution for supposed wrongs inflicted in past centuries instead of working to build a better future. When President Obama went to Cairo in 2009, did he fail to realize that this radical ideology existed? Or did he simply choose to ignore it? Because the ideology is a fact. It exists in many corners of our world today, and in all of those corners – right now – are violent men planning to come out from their corners and attack the innocent. So we as a citizenry, have the right and responsibility to ask: has apologizing for America and denying that we should take a leading role in global affairs led others to love us… or to even like us? Has it lead them to respect us? Quite the contrary! When upheaval swept the Arab world in 2011, the epicenter was Cairo. An American ally was tossed aside in favor of the rule of the streets. The Muslim Brotherhood is now in control – not because they have the backing of a majority of people, but because they are the strongest and best organized. And our President doesn’t know whether Egypt is an ally or not. All of this has sent an unambiguous message: it is that America is weak, and in decline; that ours is a nation that is an unreliable friend and a weak enemy; that we are at best a spectator of global affairs – not a leader; that we aspire to be… lesser. And a lesser America is not an America to be respected. Through my 80 plus years, I have seen the dangers of a perception of weakness. Weakness is provocative. It is an invitation. This is an administration in which the lawyers, academics, and the wordsmiths who populate their ranks characterize acts of terrorism as “man-caused disasters,” and the Fort Hood killings as “work place violence.” They use phrases like “leading from behind,” or “transnational governance” and “pooling” our nation’s sovereignty with other countries. They seem to believe America’s policies should be based on an international consensus of the nations that dominate the UN General Assembly, instead of on our Constitution and the decisions of our elected representatives. Take, for example, the Law of the Sea Treaty, which is still perilously close to being ratified by the U.S. Senate. This is a scheme that has been kicking around for decades, the idea being that developed nations like ours should give hundreds of billions of dollars in royalties to countries that have no part in exploration or extraction of mineral and oil and gas resources in the world’s oceans, those billions to be spent by many with views fundamentally contrary to ours. The Obama administration has promoted the Law of the Sea Treaty and seems to have bought into the false nobility of global governance. Why should the American people support leaders who put American interests on equal footing with foreign interests? Aren’t they elected to represent We the People… not We are the World? It should be noted that in the current battle against that treaty, the Washington Times, to my knowledge, has been the only major paper that weighed in on the debate against ratification. That is still another reason to celebrate this evening. Too often, silence is tantamount to assent. This is why we need you. In fact, we need more of you. More journalists and analysts who will report the dangerous signs seen across the globe − from a loss of leverage in Iraq after a diplomatic blunder of the highest order that failed to secure a status of forces agreement, to an Iran policy that lacks coherence, to agreeing to blindly cut some one trillion dollars from the defense budget over the coming decade, to a totally botched “reset” button with Russia. Think about that. It’s breathtaking! Here is an American president who claims he is standing strong for vital American interests, but behind closed doors is promising the President of Russia that, if he wins, he’s ready to concede to Putin by abandoning a missile defense system that has its purpose defending our people and our friends and allies. It says volumes about his lack of respect for the intelligence of the American people. And it screams the question as to what else might he be planning to do after he is no longer accountable to American people? And last, returning to what I mentioned earlier, we need more thoughtful reporting on what may be the beginning of a revolutionary movement – not an Arab Spring, but an Islamic winter, that brings a chill of hatred and violence against the United States. A few weeks back, Governor Romney was criticized in the press for bringing up President Obama’s national security record − that was shortly after he was being criticized for slighting foreign policy issues during the campaign. Pundits said it was an inopportune time to criticize the President in the wake of the assassination of the U.S. ambassador to Libya. Utter nonsense! And where was the President after the four Americans and our Ambassador were killed in Libya? He flew off to Las Vegas for still another fundraiser, with barely a word of criticism heard. In every election I have witnessed over the past many decades, foreign policy has played a role. And it should. Indeed it must. In fact, this campaign has focused too little on national security policy. We live in a dangerous world. Governor Romney is right to point out the differences in his view of America’s role in the world from the President’s views. And the differences are notable. We should welcome a critique of the national security policies of the past four years. Someone has to do it. Too often, the press is spoon-fed leaks designed to make the President look decisive. The nation’s secrets are plastered across newspapers, served up as scoops to reporters friendly to the administration. Within hours of our special operation forces taking bin Laden’s body from that compound in Pakistan, operational details of the raid were in the press. As a result, a Pakistani doctor reportedly involved in the operation was arrested and sentenced to prison, where he remains this evening, even as we meet. This kind of airbrushing and distortion of the actual record can be effective – for a while – but I have faith in the American people. They know right from wrong. They have sound inner compasses that, over time, help them sift through scraps of information and make sound judgments. But to do that, they need to be armed with facts. They need to hear from those who tell the truth. That is even more important in this new century given the rapidly growing modes of communication and the flood of information American voters receive. We live in an era where one person can start a false rumor on a blog, and have it span the globe in minutes. As Mark Twain put it, “A lie travels halfway around the world before the truth has a chance to put its boots on.” And that was in the time of telegraphs, not tweets. The role of journalists now is more important than ever – to inform, to educate, to give people an opportunity to hear all sides of an argument, to correct falsehoods and puncture myths. That is the hallmark of an outstanding news organization. And that is what Americans have come to expect from the Washington Times – those who read your newspaper every day and the increasing number who follow this paper online. You influence and inform those who shape American and global policy. And you do it the right way – with a commitment to facts, to freedom, and to integrity. So I thank you. I thank you for what you do and how you do it. I salute you for your record of accomplishment over three decades. And I hope and expect to follow your good work for years to come.